1 – Where do you think you’ll finish this season? What about Newcastle in the Premier League? 2 – The signing of Bojan was seen as a big surprise and bargain, how has he settled in and what do you expect to come of him? 4 – Who is your most important player? 5 – Are you surprised how well Hughes has done? 6 – If your club was a footballer, who would it be and why? 7 – Do you think that Ryan Shawcross should be given more of a look in internationally? 8 – What is your take on the situation at Newcastle? 9 – Stoke have underwent a huge change in the past decade, how much further can you go? Can this beleaguered Newcastle playing staff do it on a wet, windy Tuesday night in Stoke? We can’t say. What we will soon be able to speak to, is can they do it on a cool, cloudy Monday night in Stoke. Since returning to the top flight, Newcastle’s have lost 3 games at the Britannia. Last season a decidedly dull and lifeless performance allowed Stoke to coast to a victory. A solitary deflected Erik Pieters goal always looked enough for the Potters, safe in the knowledge that Pardew’s men yet again posed an almost undetectable goal threat. However, Halloween 2011 is often quoted as one of Pardew’s best away performances as Newcastle boss; an efficient attacking performance with a clear tactical plan resulted in an impressive 1-3 victory. This game is also noticeable for the positive analysis of Gary Neville, forcing many Newcastle fans into the peculiar position of begrudgingly heaping praise on the former Red Devil. Mark Hughes’ Stoke have had a mixed start to the season, accumulating 5 points. Having finished last season in 9th with 50 points, their highest ever tally, expectations have been raised. Adapting a less direct style than under predecessor Tony Pulis, Mark Hughes’ summer dealings were a mixture of steely experience or exciting pacey and skilful players. Eyebrows were raised at former Barca prodigy Bojan coming to the Potteries, but so far Mame Diouf has made the biggest impact. Diouf’s seventy yard run and cool finish sealed a victory away at Manchester City, by far the best result of Stoke’s fledgling season. However, this has been balanced by disappointing home defeats to Leicester and Villa. 2 – What do you think of Warnock’s comments regarding the League Cup not being a priority and his plans to use it as a chance to give minutes to some players he hasn’t seen yet? 5 – How seriously are you taking the cup? Would you rather focus on the league? 7 – What do you think your chances of resigning Zaha permanently are and would you want him? 8 – How do you feel about the Pulis/Warnock situation? Were you happy with Pulis and is Warnock a suitable replacement? 9 – Although it seems okay at the moment, are you worried about Puncheon’s relationship with Warnock? If it came down to it, who would you rather keep? We’ll be battling it out in the bottom half along with 10 other teams. The PL looks very even this year compared to normal, i think everyones going to be beating everyone with very few teams dropping through the floor so it’ll be a battle to the end. We’ve got a pig of a run in this year so i hope we don’t have to play catch up at any point. We have a lot of good players not getting a game so i reckon our second outfit is close to being as strong as the first. Johnny Williams is very unlucky not be involved in the first team. It seems small players just don’t quite have the physicality for the premier league so he doesn’t get a look in which is a shame as he’s a fabulous player and has come through the ranks. For me Wilf is still going to be our class act this year. This cup is a major chance of glory and personally i’d love to take it seriously. It also gives your squad players a chance to play and be match fit so i think its hugely beneficial for both league and cup for us to have a run in the cup this year. The only sad thing is that if you did win it and got in the Europa cup, that would be the kiss of death to a club like us. We’d certainly want to have him here for as long as possible, we all love him to bits but it seems he still has his sights set on Man U, god knows why, i’d avoid it like the plague if it were me. I’m hoping he isn’t so good here that manU want him back and then we can sign him permanently. Warnock is doing a great job, we were all shocked to lose Pulis but his heart wasn’t ever in CPFC, Neil Warnock and Palace has always been a good match in my view. Not at all, thats done and dusted. Hard to predict but i reckon Palace will edge it. Three weeks on from the 3-3 thriller (perhaps thriller isn’t the word, but it sounded nice) we again face Crystal Palace, albeit this time at Selhurst Park and in the League Cup for an 8PM kick-off that must be settled on the night. Newcastle defeated the mighty Gillingham to get to this stage, with Palace winning against Walsall. Since the two sides last met, Newcastle have put in an utterly disgraceful performance away to Southampton, mirroring the 0-4 defeat of last season, followed by Cissé somewhat saving our sorrows by snatching a whole point from Hull at home. Palace, meanwhile, played a scoreless draw against Burnley and then won in impressive fashion against Everton, the scoreline reading 3-2. Newcastle head into this game on the back of a 4-0 defeat to Southampton last Saturday, while Hull come into it having drew 2-2 with West Ham on Monday night. The scoreline flattered a shambolic Newcastle United side on the south coast, it quite easily could have and perhaps should have been a 6 or 7 nil defeat. Still though, a 4-0 defeat was enough to firmly place Newcastle United at the bottom of the Premier League table with just 2 points from 4 games. 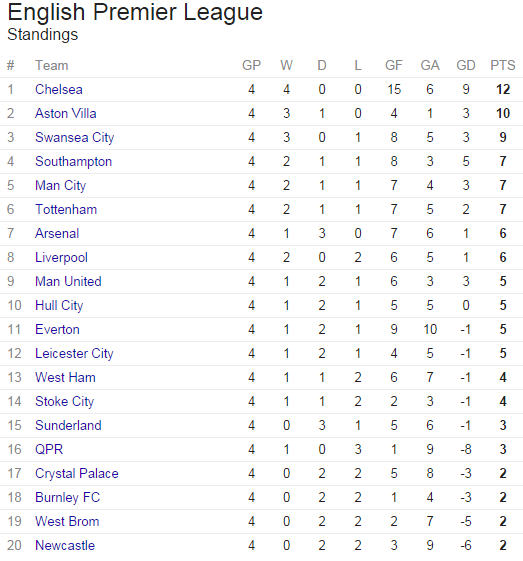 Our visitors this weekend sit in 10th place with 5 points from 4 games.